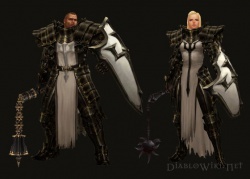 The Crusader is the sixth class and will be available with the first Diablo 3 expansion pack Reaper of Souls. The crusader was first seen in the [III: Reaper of Souls Revealed] Article. Crusader active skills can be found here. Crusader passive skills can be found here. Crusaders are an off shoot of the Paladins, holy warriors of the Zakarum church. The developers have described them as a sort of "special forces" branch of the order, specially trained and geared to battle evil in all forms. Blizzard CM Nevalistis offered a concise description of the class differences in a forum post from January 2014. The Paladin, Templar, and Crusader are all from different branches of the Zakarum faith. The Zakarum itself is a series of teachings from Akarat, the founder of this religion. Very little is known of Akarat himself, as after he spread his teachings in Kehjistan, he ventured into the east and was never seen again. The worship comes from embodying a series of ideals rather than the belief in a centralized deity. The Paladins serve as the militaristic branch of the Zakarum faith. It's important to note that this is an overarching group, and includes but is different from The Order of Paladins, where the Diablo 2 Paladin had his origins. This order broke away during the Zakarum Inquisition and later merged with the Knights of Westmarch. There are several orders of Paladins, so think of them as a very large organization, many with different goals or motivations, though all devoted to the Zakarum. The Crusaders, at the time of General Rakkis' journey that ended in founding Westmarch, were created in secret and sent to the East, by a Zakarum cleric named Akkhan. He was growing concerned that there was a darkness creeping into his faith. The Crusaders still continue this mission, seeking a way to purge the evil that has tainted their faith. The Templar are a different branch of the Zakarum founded in Westmarch, well after the city itself was founded. Very little is known about their ultimate goals or internal operations. If this is something you're interested in, I definitely recommend talking to Kormac. ;) His story will be explored a bit more in Reaper of Souls, as will the stories for the other followers and artisans. This article is a stub because it needs to be filled out. Help by expanding it. This page was last edited on 20 February 2014, at 04:48.